When Does a Christian Yield? When driving a motor vehicle or bicycle, drivers have to follow rules of the road for safety purposes. We have to learn many of the laws, and there are also times when signs are posted. 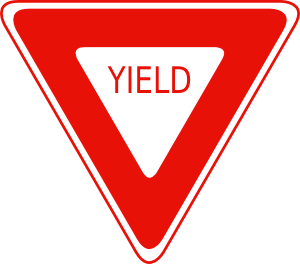 The US and some other countries have a triangular red and white sign that says "Yield" (some Commonwealth countries have "Give Way") which mean to back off and let other traffic proceed or merge into your lane. On the highway's on-ramp, you have to safely merge with the traffic on the highway because they have the right of way, so you yield to them. I overheard someone complaining that it's the merging driver's responsibility, so she doesn't have to move over or slow down. That's myopic and selfish. Not only could this indignant motorist show some courtesy and help the merging car get into the flow of traffic, but it's in her best interest to help the other driver merge if possible (she might be in the newcomer's blind spot or something, and nobody needs a collision). She can be legally right, but also selfish and stupid — and I don't reckon there's any law against that. In the pastoral epistle of 1 Timothy, there are instructions in dealing with certain people in the church, including elders and widows. But it seems to me that people tend to miss 5:1-2. I like how the International Standard Version translate it: "Never speak harshly to an older man, but appeal to him as if he were your father. Treat younger men like brothers, older women like mothers, and younger women like sisters, with absolute purity". (The King James Version uses the word "elder", which can be a bit confusing, because this is about someone who is older, not someone in the office of church elder.) For that matter, some Christians seem to forget that we're supposed to do good to others, especially other Christians (Gal. 6:10). Aside from showing respect and not giving harsh rebukes, should we yield to their knowledge and experience? How much respect and deference should we give them? There are times when respect comes with position or office (like your supervisor or the President of the United States, no matter how you feel about each one as a person). We are supposed to "fear God" (for Christians, the biblical word "fear" does not mean "quaking in your boots", but "awesome reverence"). We should show some basic respect to other people, since we're all created in the image of God. From a basic starting point, respect has to be earned. Let's ride off on a side trail for a moment, then we'll come back. Imagine a young officer in the Army who came from a respected military family or did something to impress his superiors. He gets promoted and assigned to command a fort. There are men at the fort who have been in the Army for years, and the sergeant knows operations seven ways from sundown. The captain gives a ridiculous order, the sergeant disagrees, the captain insists. "Whatever you say, Captain!" But the captain could earn the respect of his experienced men. One way is to show some humility and listen to their voices of experience instead of demanding the respect due his position. Another way is to gain experience over time. Courage and integrity go a long way, too. People who are young and inexperienced in the Christian faith are often full of enthusiasm, and can be abrasive. Some will even get assertive and express opinions on things that they know nothing about. In a similar way, someone who is a pastor or other church leader can rely on his education and show off his smarts, but ignore the knowledge and experience of others. I've had years of experience as a Christian, and there are areas of special study that can edify others (such as the Web world, see "Different Worlds of Ministry"), and how some Christians let misotheist bullies take charge and end up answering fools according to their folly, and becoming like them, or having an online creation science ministry.) However, I need to be open to wisdom from someone who has been raised in the church and grew up on the mission field, or is a pastor, or has special training in areas where I am weaker — or another Christian who has wisdom that I need to hear. (Hopefully, Christians will be willing to listen to me about my areas of study.) All of these people may be chronologically younger than me, but are "older" in some ways. It's not always easy to be willing to listen, I admit. It doesn't mean that you have to appeal to authority and accept whatever someone has to say, but neither should we wave them off because of our own education, experience, and possibly arrogance. The way I cognate on this, Christians need to prioritize treating each other with respect (1 Tim. 5:1-2, Gal. 6:10). Although the text I used doesn't address this, I believe the principle applies: earn the respect of other believers, show humility, be willing to listen and learn. We're the body of Christ, supposed to be united in love and supporting each other, and each has a part (John 13:35, Eph. 4:14-15). It would help if we would listen to others who may have knowledge and wisdom that we lack so we can get back to the business of equipping the saints and spreading the gospel. Yield when expedient.